Never be a victim of cold coffee again. The Mr. Coffee Mug Warmer keeps coffee, tea or coco hot when you want it. The extended cord allows the device to reach office desk or kitchen tables. This is the perfect dad gift for the busy working dad. The Rocketbook Wave is unlike any notebook before it. This unique book provides the freedom of a traditional pen and paper notebook, while instantly blasting your notes into the cloud. When the book fills up don’t throw the Rocketbook Wave out. Instead, erase your notes using your microwave. Stream just about anything with the Roku Streaming Stick – movies, broadcast TV, music and live sports. With the Roku Streaming stick receive access to 450,000+ movies and TV episodes. The Philips Norelco Beard trimmer Series 7200 will keep your dad looking sharp this Father's Day. The trimmer is designed for a clean experience with less mess. With an integrated vacuum system loose hairs are caught to clean the mess. The Echo Dot is a hands-free, personal assistant created by Amazon. Dot connects to Alexa to provide information, play music and make phone calls. This is the perfect gift for a dad with a big family. It will remind you about important info and can be told commends in noisy environments. This all-natural set includes salves, scrubs and balms that will pamper your dad. If he struggles with sore feet, dry skin and cracked knuckles this kit will exceed all expectations. Stream high quality movies, Tv shows and music while connected to a WiFi network. In order to access the Chromecast Ultra you can use a iPhone, iPad, Android device and Laptop. The Chromecast Ultra is the perfect Father’s Day Gift for the dad that wants more out of their TV. Easily organize up to 45 ties and 4 belts with the sharper image motorized tie rack. The mechanism fits into any standard closet - attaching to a closet rod. Three LED lights are included for use early in the morning or at night. If your dad is a dapper man this is the Father’s Day gift for him. Tile is a small device that attaches to your keys, phone or car. The gps chip in the Tile can locate your items when you can’t. Simply, use the tile app to activate the device. The Tile plays a loud sound until you find it. If your phone is missing, don’t worry. You can press any tile and it will ring your phone. A jewelry box finally for men. The Leather Charging Station Valet is a charging station and jewelry box in one. There’s plenty of room for a dad's watch, hair products and colognes. The station also include a charging port for his phone! The SmartThings Hub connects, via bluetooth, with hundreds of smart home devices. You can monitor sensors, lights, locks and cameras. If your dad is a travel man, this is the perfect Father’s Day gift. The DBPOWER UDI U818A is the best dad gift for amateur drone flyers.Enjoy live video from your iPhone or Android! With HEADLESS MODE you can easily control the drone's movement. The Pit Master Crate is the best Father's Day gift for a grill master. 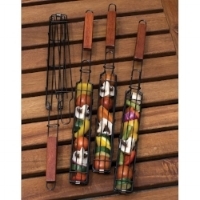 It includes a variety of grill tools and sauces. The crate includes amazing recipes that inspire anyone to be a great chef. Powered by the Google Assistant, the Google Home satisfies all your home needs. Voice recognition software allows the device to personalize your entire family's experience. The Spire tracks your location, time, and activity. The devices sends your phone weekly and monthly reports to help handle stress. Breathing guides, based off the reports, walk you through personal breathing sessions to calm your nerves. Philips Hue light are smart lights that change based on the time of day. In the morning the lights gradually increase their brightness. While in the evening, the lights turn warm to help you relax and prepare for the night. Ring, a smart doorbell that lets you monitor every corner of your property. The device connects with your phone to access to camera. Say someone you do not know rings your doorbell. From your phone you are able to talk to the visitor as you wish. Use the Promo Code REF-72TVB8IPRT for $10 off this Father’s Day! Nest is a smart thermostat that shows you how much energy you use every day and every month. Over time, Nest learns your desired energy usage. As the nest learns overtime your usage it helps you save money and time. This smartwatch is part of the Android Wear 2.0 family. The watch can take emails, calls, messages—right at your fingertips. No need to worry about adding all your info to the watch. It automatically connects to your smartphone—syncing your apps, activity, and data.